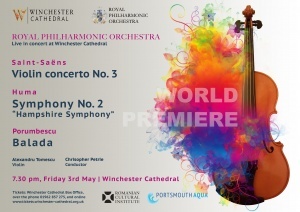 Following a high-spirited evening at London’s Cadogan Hall, our collaboration with the Royal Philharmonic Orchestra continues with a unique concert hosted by one of Europe’s finest medieval cathedrals - Winchester Cathedral. Renowned violinist Alexandru Tomescu joins the celebrated orchestra and adroit conductor Christopher Petrie for an evening that promises to blaze with passion and virtuosity. While the first part of the programme pairs the impressionistic Violin Concerto No.3 by Saint-Saëns with a musical gem of sheer Romantic indulgence by little-known Romanian composer Ciprian Porumbescu – ‘Balada’, the second part will feature the World Premiere of Călin Humă’s Symphony No. 2, also known as the ‘Hampshire Symphony'. Christopher Petrie's conducting encompasses a broad artistic palette, with current interests including the music of Enescu, Mendelssohn, Elgar, contemporary works, and the Parisian Belle Epoque. 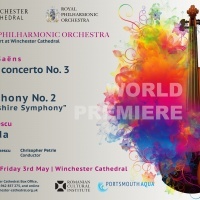 Chris Petrie has conducted orchestras across Europe, including the Vienna Tonkuenstler Orchestra, Lithuanian State Symphony Orchestra, Philharmonie Horst (Germany), Sibiu & Oltenia Filarmonicas (Romania), University College of London Chamber Orchestra and Monmouth Festival Ensemble (Wales). Soloists with whom he has worked with include pianists Leslie Howard, Tom Poster and Alina Azario, violinists Andrey Baranov and Remus Azoitei, cellist Filip Papa, and many others. Chris is currently the Artistic Director and Principal Conductor of the Philharmonic Chamber Orchestra. Chris studied at the Royal Welsh College of Music and Drama and the Royal Academy of Music, London.